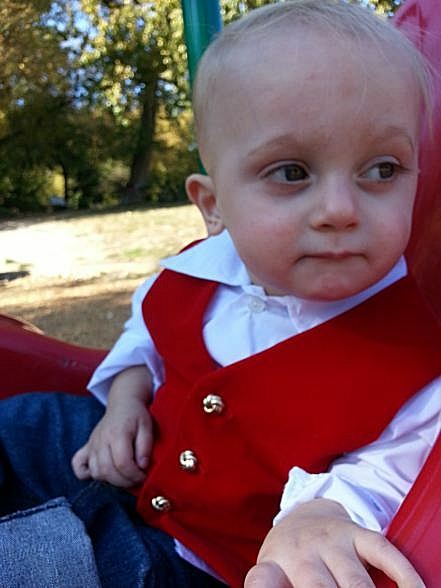 DapperLads - Toddler Red Vest - English & Full Dress Vests - English vests with ruche ties. Rugged Butts formal vests, argyle golf sweater vests with argyle knee socks. This versatile lined dressy-casual vest is in a cotton velveteen material with gold buttons. Of average quality - not too formal or fussy so it can go casual with jeans and a top or more dressy if desired. Makes a nice wardrobe addition for a comfortable dressy-casual outfit. The model is wearing the Lito long sleeve dress shirt and jeans. US made. Machine washable on low. Hang dry. Popular choice for plays and performances. Quantity discounts available - just ask!